Bitter Betty Blogs: Felt Daffodil: Free Pattern and Tutorial... Because I love You Guys. 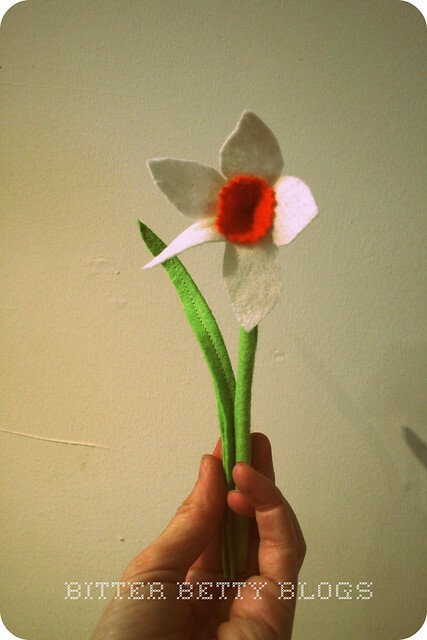 Felt Daffodil: Free Pattern and Tutorial... Because I love You Guys. Cut out all the pattern pieces with regular scissors, except for the top of the center piece. Cut that with pinking shears. Roll the center into a tube and glue or stitch the sides together. I used a contrasting thread to show you how. Sew a running stitch along the bottom of the center piece. Be sure and leave long tails on the thread. and tie with a hard knot. Trim. Scrunch up the petal piece a little and stitch to the center piece around the bottom. There is your finished blossom. Glue or stitch the felt around the bamboo skewer and seam the leaf up the center for a flower that stands up. 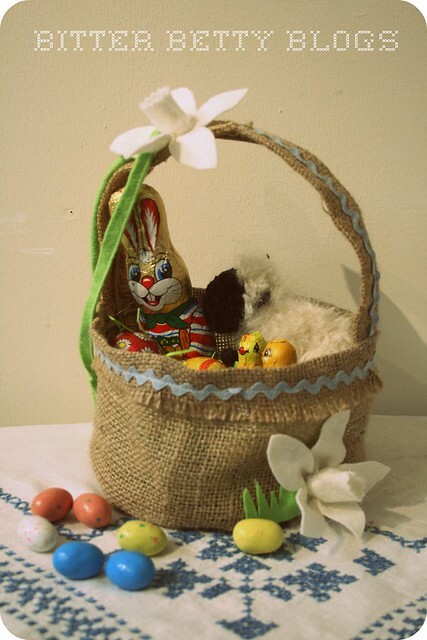 I love it Momma I would love a whole bunch, I can't wait for my treasure to come!!! and can't wait to show you this coat when I get it back from my seamstress I had her put on a vintage touch, you inspired me...I can't wait to show you!! Just found you on Heidi's site. I love this felt flower!! I am so making these this weekend!